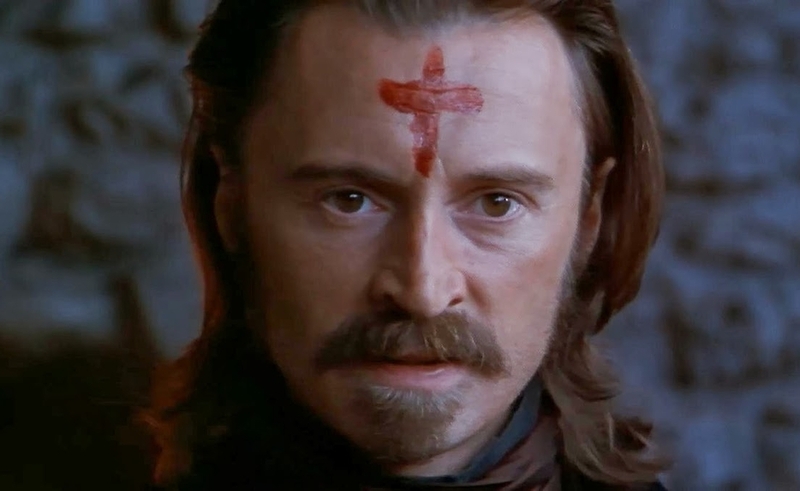 In its crudest form (which is perhaps what Fox thought it was buying), Ravenous is a “cannibal comedy.” Pearce plays 1840s U.S. Army Captain John Boyd, who’s assigned to the remote Fort Spencer in the California mountains. There, he’s surrounded by a band of eccentrics, played by Jeffrey Jones, Jeremy Davies, David Arquette, and Neal McDonough. They’re soon joined by a mysterious stranger (Carlyle), who spins a tale of how he and his traveling party were lost in the wilderness and had to resort to cannibalism. But when the soldiers go looking for survivors, they find their guest has been leading them into a trap, and is planning to eat them. This especially distresses Boyd, who once swallowed some of his former comrades’ blood while cowering through a battle in the Mexican-American War, and ever since has been fighting his own hunger for human flesh. Ravenous is misbegotten in multiple ways. It isn’t scary enough to be an effective horror movie, or funny enough to be much of a comedy. Some of that can be chalked up to studio interference, which left Bird with limited time and resources to get the shots she needed. But given that the rest of her filmography is dominated by social dramas, not genre films, it may be that Bird (who died unexpectedly in October 2013) was ill-suited to the material from the start. There’s an awkwardness to Ravenous’ more violent scenes, and while Carlyle and Jones give zesty performances, the rest of the supporting cast is quirky to a fault. Pearce uses his character’s haunted sullenness as an excuse to do almost nothing onscreen, leaving a yawning gap in the center of the film. But say this for Ravenous: It isn’t generic. From the moment Michael Nyman and Damon Albarn’s tinny, non-traditional score rises, there’s a, “Wait, did they mean to do that?” quality to the film. Ravenous doesn’t sound or look like other movies—for better and for worse. That eccentricity helps once it becomes clearer that Ravenous is meant to function as a historical/political allegory, using the “survival of the fittest” plot as an analogue to the way the U.S. gobbled up land throughout the 19th century. The movie is really about Boyd’s ethical crisis as he realizes that being a soldier—and a cannibal—means swallowing things he finds distasteful. Bird and Griffin aren’t shy about making that point; Ravenous openly declares its meaning over and over during its final half-hour. But the rest of the film is so entertainingly odd that the lack of subtlety doesn’t seem so egregious. Whatever the circumstances that led to the cast and crew of Ravenous feeling abandoned and aimless, from scene to scene, they did their best to make something distinctive. Sometimes that manifests as a meek soldier whining, “He was licking meeeee!” Sometimes it means Boyd staring at an enormous bloody steak on a plate—with no sides—and seeing his whole miserable future. One of the more unexpected releases from Shout! Factory’s Scream! Factory imprint (if only because it’s more an art-film than a straight-up shocker), Ravenous is out in a special-edition Blu-ray that’s as loaded as any other disc from the Scream! line, though nearly all of its extras are imported from the original Fox DVD. The set contains three sparse commentary tracks that should’ve been edited together into one really good one, with Bird and Albarn on one track, Griffin and Jones on another, and Carlyle on a track to himself. (The Griffin/Jones track is the most informative.) Also included is a new interview with Jones that’s more forthcoming about the behind-the-scenes troubles than any other extra here, plus 12 minutes of deleted scenes, with Bird’s commentary explaining what the scenes are, but not much about her struggles with the studio over the final cut. Like everything else having to do with Ravenous, the Blu-ray’s bonus features are just impressive enough to make it disappointing that they aren’t better.